Scanning electron micrograph of human T cell. Image courtesy of National Institute of Allergy and Infectious Diseases. The Independent Citizens Oversight Committee of the California Institute for Regenerative Medicine (CIRM) today unanimously approved a $5.8 million award to University of California San Diego School of Medicine researchers to develop a new immunotherapy in which patients’ cells would be equipped with a special receptor that recognizes and targets cancer stem cells, whose survival abilities often render standard therapies ineffective or short-term. The award, to a team of scientists and physicians headed by Ezra Cohen, MD, professor of medicine and associate director for translational science at UC San Diego Moores Cancer Center, builds upon earlier and on-going research involving the receptor tyrosine kinase-like orphan receptor or ROR1, which is expressed in both solid and blood cancers but not in normal tissues. Another UC San Diego team, headed by Thomas Kipps, MD, PhD, who holds the Evelyn and Edwin Tasch Chair in Cancer Research at Moores Cancer Center, is already conducting a first-in-human phase 1 clinical trial of cirmtuzumab, a ROR1-based humanized monoclonal antibody drug, on patients with relapsed or refractory chronic lymphocytic leukemia (CLL). The name cirmtuzumab is a nod to CIRM, which has provided sustained funding support for basic research and development of ROR1-based therapeutics at UC San Diego. The new CIRM grant to Cohen’s team represents a new and more aggressive step toward addressing cancers that defy standard treatment. 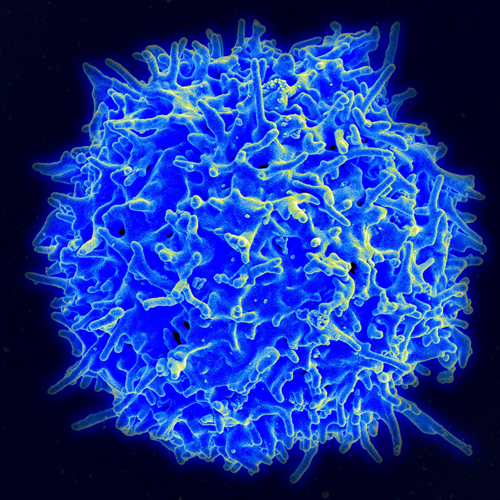 It is an example of emerging CAR T-cell therapies in which a patients T cells (a type of immune system cell) are extracted and altered in the lab. In this case, a gene is added to allow T-cell activation when interacting with ROR1. Large numbers of the altered T cells are grown and then infused into the patient where, it is hoped, they will seek out and destroy cancer stem cells expressing ROR1. Previous research at UC San Diego School of Medicine has shown that ROR1 CAR-T cells target and kill ROR1-expressing cancer stem cells in in vitro models of head and neck squamous cell carcinoma, triple-negative breast cancer, pancreatic cancer, ovarian cancer and chronic lymphocytic leukemia. All five cancers are among the most deadly, difficult to treat or most likely to recur. Cohen said the new CIRM grant will support work to create proof of concept and pilot safety data necessary before plans for human early phase clinical trials can begin. “Our overall goal by the end of this 30-month process is to have a full-fledged, pre-clinical plan in place, with input and support from the FDA, so that we develop a new drug and test it in clinical trials,” he said. The effort is part of a larger immunotherapy program at Moores Cancer Center that is currently conducting multiple clinical trials exploring novel immune checkpoint inhibitors and tumor vaccines. Cohen, a noted head and neck cancer specialist, is co-director of the San Diego Center for Precision Immunotherapy, a collaboration with the La Jolla Institute for Allergy and Immunology. Philanthropists Ralph and Fernanda Whitworth and the Immunotherapy Foundation provided initial funding for Cohen’s pilot research related to the CIRM grant. Ralph Whitworth was a well-known San Diego activist investor who died in 2016 of complications from cancer. CIRM was created in 2004 by California voters with $3 billion in funding support to accelerate stem cell research and treatments. Since 2004, UC San Diego researchers have received at least 95 CIRM awards, totaling more than $177 million. At the center of this effort is the Sanford Stem Cell Clinical Center at UC San Diego Health, one of three CIRM-designated “alpha clinics” in the state created to support research and clinical trials. The Sanford Stem Cell Clinical Center was established in 2013 with a $100 million gift from philanthropist T. Denny Sanford.